Enrol below to start your free English Pronunciation Course. Start improving right now with our free English pronunciation course online. Improve your pronunciation skills and English accent with this short course. Over the next week you’ll get 1 daily email full of awesome videos, hot tips and links. This is THE BEST place to start on the path to clearer, more confident professional English. With this free English pronunciation course online you’ll correct many commonly mispronounced words, discover your strengths and weaknesses and improve key pronunciation areas like word stress and diphthong vowels. What you’ll learn with our free English Pronunciation Course Online. Speaking clearer, more confident English makes life easier. Whatever your reason is, we look forward to helping you speak clearer, more confident and more fluent English. This short free online English Pronunciation Course will help you get started on the journey to clearer English. What’s so special about Speech Active Courses? This free English Pronunciation Course and our full online courses are tailored to your first language – this ensures you learn in the most effective way. This is not a one-size-fits-all course. Check out more about our Online English Pronunciation & Fluency Courses for speakers of your first language. Speech Active online English Pronunciation & Fluency Courses have been created by a team of Speech Pathologists, e-learning specialists and ESL tutors. So you get the benefit from all these angles! Many people wonder if this course is as-good-as or even better than face-to-face training. Or they would like to understand how they will know they’re improving as they take the course. You can see our frequently asked questions for the answers. 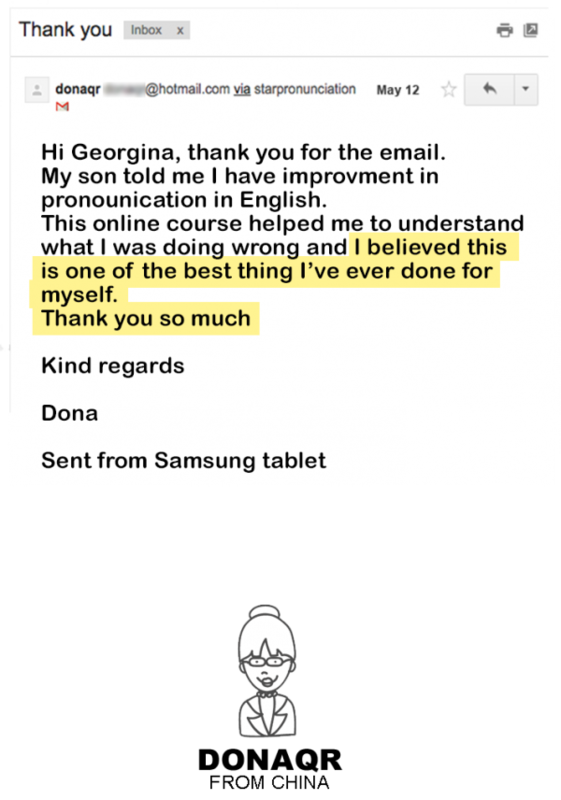 Read some reviews and comments from our students to see how our English Pronunciation course online and our English accent training has helped them. Be sure to register for our free English Pronunciation course online to start improving today. And remember, our courses are all tailored for speakers of your first language, so you’ll need to put your first language in too! We are all about getting you speech-active! Yes, just like your tennis coach gets you in to shape with drills and practise sessions – we do the same for your spoken English. We give you the practise you need to level up your spoken English. Correct your pronunciation problems so you are easily understood and become more fluent when talking on a range of topics. Improve your expression and understanding of English. Our courses will help you improve your OET, IELTS, PTE speaking scores. Signing up to our free English pronunciation course online is a great way to start. More on how Speech Active courses will help you speak better English! Word stress – master the rhythm of English – this is SOOOO important! By signing up to our free English pronunciation course online you can get started today. Simply enter your details to start right now. Because they are customised for speakers of your first language – you only work on the areas that speakers of your first language find challenging. We use real examples – understand exactly what you’re doing and how to change it. Flexible, self-paced study – access it anywhere, anytime. Our courses have helped over 4,000 people advance their careers with improved spoken English. We know what works! We have created these courses specifically for busy professionals. Online study with video and audio allows you to fit in learning around your busy schedule. See more reasons why online study is a great option. You’ll love the tips, but the best way to speak better English is to enrol in a course. Choose an English Pronunciation & Fluency Course here. If we don’t have a course for speakers of your first language, email use at [email protected] with your name, phone number and first langage and we can create one especially for you. For more on how our courses well help you to speak clear English check out our FAQ’s. Please, don’t just listen to us, see what our clients have to say.